Another situation that impacts outdoor living designs in urban areas is the absence of large trees to provide shade. Both of these dilemmas have solutions that make it possible for you to enjoy the warm months outside in a pleasant and relaxing manner. There are various ways to create a private or semi-private outdoor living space on a patio, balcony or deck. You can even use some of these ideas to create a secluded oasis on an expansive piece of property in a rural location. * You can build a wall around a patio using privacy fence panels. These panels provide the perfect place for adding patio lights, outdoor sconces or brackets for hanging baskets. * The privacy on a deck, balcony or patio can be increased with the addition of lattice or trellis structures placed around the perimeter. You can add outdoor fabric to the structure to increase privacy. If you prefer something more natural than fabric, you can create a living privacy wall by placing planters at the base of the trellis and planting some type of rapid growing vine to train up the trellis. * The addition of large tropical plants will also create some seclusion. * Folding decorative screens are an attractive way to acquire some privacy on an open patio or deck area. An outdoor space that receives sunlight for the largest part of the day may not be a pleasant place to spend time during the summer months. There are several decorating tactics that enable you to create your own source of shade. * When choosing an outdoor dining set, be sure to include an umbrella in the design. That will make your outdoor dining experience more enjoyable. * Once again you can benefit from the addition of large plants potted in containers placed around your outdoor space. 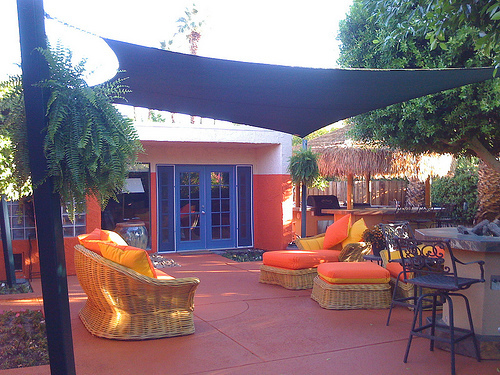 * Shade sails may be the urban dwellers best outdoor decorating idea. You can find these in a variety of colors which makes it easy to create everything from a festive outdoor space to a sophisticated exterior living area. Adding a shade sail to your hot tub area is a great idea. You can extend the use of the patio, deck or balcony on your urban townhouse or apartment with the addition of one or more shade sails. Sometimes, the outdoor space in a rural setting can be too expansive to feel cozy. You can create a personal, perfectly sized retreat using nothing other than a shade sail and a comfortable chair. Attach the shade sail to a couple of trees and you will instantly create a small outdoor room that is wonderfully cozy and relaxing. Shade sails can be used as an alternative to a pergola or gazebo when you want to create an entertainment area in a large yard. Using one or more shade sails, you can design a comfortable sitting area where you are protected from UV rays any time of day. You should not be discouraged from expanding your living space to the outdoors just because your outdoor space is not very private and void of shade. There are plenty of outdoor accessories to help you create a private lounging and dining space or a secluded retreat. Haven't tried a shade sail, but I like it. Thanks for the idea.